Data Caps – Bad, Ugly or Evil? That’s right, there is no way in the world the data caps imposed by ISPs are in any way good. They are either bad, ugly or evil – or, most likely, all of the above. Here’s why. By limiting (in any way) our consumption of internet as a resource, ISPs are essentially setting up a mental model that “your internets may run out“. Imagine the next iteration of home routers that, in addition to bandwidth metering will have an off-switch, once you hit 99.9% of your monthly allowance it will switch your connection off to prevent an outage. Your car has ran out of gas. With astronomically high overage fees it’s obvious no one would want to pay for it. Households will – consciously or subconsciously – limit their use of internet. Which means – a lot less online video, online games, in fact – a lot less of our usual online activity as a whole. Your Facebook updates don’t take much, but any video streaming (YouTube/Hulu/Netflix), Skype/Oovoo video chat or games downloading goes out the window. Those cute baby videos you’ve uploaded for your grandma in Michigan – bye bye. If you’re just checking e-mail or working on some documents – you may still fit into your limit, but if your job requires some massive data movement or exchanging large files (think – video editing or backups or database dumps to your local development environment) – goodbye working from home. Who is going to win? In a short term – ISPs, of course, that will keep profiting until their customers will adjust to new usage patterns. After that (I’ll give it a few months, two – three quarters tops) their cash inflow will significantly drop. In addition to that – they’ll keep spending a fortune on army of lawyers battling class action suits where they will have to explain our computer-illiterate judges why 100kb picture takes 120kb of bandwidth (HTTP headers overhead? Good luck with that mumbo-jumbo). That is – instead of investing money in upgrading the infrastructure. Who is going to loose? Everyone else. Consumers will suffer the most, since there is no real way we can vote against that, thanks to government supported monopolies (try finding an alternative to a high-speed ISP in your area). We may actually go back to REAL human interaction, exchanging movies and TV programs via removable flash drives and hard drives (Arrgh, those damn pirates would never stop, would they!). Content providers will see a decrease in demand which, in turn, will result in a lot less money available to be invested in the whole online content business model. They will have to spend another fortune on lobbying laws and regulations in their favor – instead of spending that money on acquiring better content or improving their own infrastructure (CDNs and such). Most likely in a few years we’ll see giants like Google, Apple and, maybe even some movie studios, if they hire CEOs that can see a bit further their noses and expensive suits, will lobby for some kind of solution that will neutralize the negative effects of caps, at least to a satisfactory level. However, the time we will lose will inevitably put us so far behind our main technology competitors that we may never be able to catch up. It’ll be like cell phone market – we’re still paying around $5 for 200 SMS (while they are totally free to phone company) and are capped to measly 2GB of cell data plans while in some other “not-so great” countries people already using their cell phones for video streaming and full blown video conferencing. Try that on your 2GB plan of “fastest some-G network” that drops regular voice calls like crazy in the middle of the largest US cities. But This Is A Brand New Computer?! While doing various demos with clients I can’t help but notice one scary trend. Client usually checks the demo page from his or hers computer, prepares a list of issues and then we meet to go over them. A lot of clients complain right off the start that their web site doesn’t look exactly like it should or behaves strangely. The reason, of course is not the fact that the web sites we designed aren’t compatible with their browsers, but their browsers being dramatically out of date. There were so many times when this had happened, it actually became one of the internal internet memes. The phrase “but this is a brand new computer, we only bought it year and a half ago” isn’t that funny anymore. People are becoming increasingly overprotective of their computers, calling them their “friends” and “babies” – “my baby is sick, can you fix it”, “my dear friend have been acting strange lately, maybe he’d caught a virus or something”. Worse yet, when you point to those issues you face further complaints that you are trying to avoid your responsibilities and you should make web site work with any browser on Earth. While in general it is true, the task is all but impossible – try stuffing that intro flash movie down the throat of Lynx and you will get the idea :). Or, more realistic scenario – the famous Internet Explorer 6.0, that some people still think is good enough browser. In fact, according to statistics on my most traffic-heavy clients’ web sites the IE 6 is 4th most popular browser, after IE 7, IE 8 and Firefox (all versions). Unfortunately, quite a few things are simply impossible to achieve in this world. One of them is the browser compatibility. However, there’s a pretty good chance that if you make something look critical and urgent and very important overall – people would listen, look and take action. So from now on if you venture to this web site using one of the older browsers (Internet Explorer or Mozilla Firefox are supported at the moment) you will see a bright yellow bar on the top of the page saying that your browser is old and needs to be updated with a link to a page where you can choose what to do as well as a link to page where I explain why it is important to keep the browser up to date. If you are using the latest and greatest but just anxious to to see what the page looks like – feel free to look here: https://www.istudioweb.com/browser-information/. Just when I was about to write how our local UPS office picked up the ball after main office dropped it – they blew it above the sky. Hour later I got a call from our local UPS office and nice lady promised that driver would contact me about an hour before dropping off my package AND drop-off will happen after five. Well, I said, thank you, this really saves me a lot of trouble. I got home something before six o’clock and find a third UPS InfoNotice flying on the floor. Which means that driver didn’t call me, at least I haven’t seen any missed calls on my phone. Tough luck, I said, and drove my 30 minutes to UPS pickup location. Today was a lights-on day, since the garbage truck garage across from UPS yard was lit to its fullest. Nice teamwork! Got inside at around 9:30pm – and the line was worse than those at the airport on Thanksgiving. In just under 30 minutes I got to the clerk who grabbed my InfoNotice and went after my package. In about two minutes he emerged back only to tell me that… they lost my package. “It’s somewhere in the building, we just can’t find it”. Nice. The guy seemed upset that I came over for the missing package and I kind of agreed that I was better off picking up the package that wasn’t missing. But this is life and my package that UPS was trying to deliver three times got lost. Guess it got upset too. Now to the brighter part. Few hours after I’ve published the previous post I got a comment from UPS’s PR lady. I held off the comment until I came back from pickup to at least say that the problem got resolved. Well it’s not and it’s not actually my problem. Here’s why. 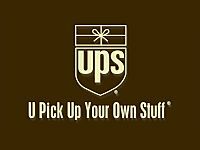 UPS is best if you order something to the location where you are present during business hours. These guys probably great for serving businesses and all, but regular folks who work day jobs and hope they can get their stuff after hours get sidestepped. I’d rather take my wife to a movie or take her out on a Friday night than spend hour and half picking up stuff that was supposed to be delivered three days ago. So, here my words to Debbie, who wrote “you’ve really had a hassle with this shipment“. Debbie, I hadn’t had a hassle. It’s the way UPS works for all who can’t schedule a delivery to their work address. That’s the kind of service (or rather lack of it) that all those people in line at 10PM on Friday night are getting. It would be just honest to state right there on your brown web site: “We’re doing business from 9 to 5. If you want to pick up your stuff any other time – come and get it yourself, you loosers”. Rant mode off. Debbie, this is still for you, though. The economy is tough, and if tomorrow someone’s gonna start a shitstorm on Twitter about how not to use UPS but use FedEx or USPS instead – you gonna have a problem. I don’t depend on UPS in my ways of doing business, but I have plenty of clients who do and they aren’t all that satisfied either. Here’s the moment of opportunity and innovation for UPS. Google the term “cell phone”. I’ve heard they’re good in establishing a two-way communication between two people, in your case – the driver and dispatch. You can also google “blackberry” and “gps phone”. Sending one-way messages to driver’s pager is so last century. Call those guys at Sprint, AT&T or Verizon, get a contract. I’m sure with tough times like these you will have an upper hand in negotiation a good deal. Next step – map your drivers. Know exactly where they are any time of the day. If you need someone to do it for you – hire me, I can get this done for you. Next step (here comes the trick!) – ask your customers when they want their package delivered. Seriously. For real. Don’t just game the numbers (“we deliver more packages…”), but actually deliver them. When customers want. Here’s how: you have live traffic maps (Google does it as well as other providers) plus you have exact location of each of your drivers. You can minimize their time driving by reshaping their route in real time according to traffic patterns. This means less gas burned, less time wasted, less destinations visited multiple times. With the money saved ask a quarter of your drivers to work second shift – from 2pm to 11pm. You won’t need many people because I imagine most of the deliveries would still be within 8 to 6 time frame. You already charge a bit more for residential deliveries, so here’s a way to put those extras plus whatever you saved to good use. This will unload the 8 to 6 schedule somewhat and reduce return trips. I’m sure you can have your own quality improvement department cough up the real numbers to do the math. But in addition to this all – you will get a customer satisfaction beyond any imaginable level. Which means – more business for your company. Isn’t it a win-win?